SB 1785, DOC III 3 AU Histamenon Nomisma Obv: Facing bust of Christ. Rev: The Virgin crowning John, who holds patriarchal cross; manus Dei above his head, MОё above hers. 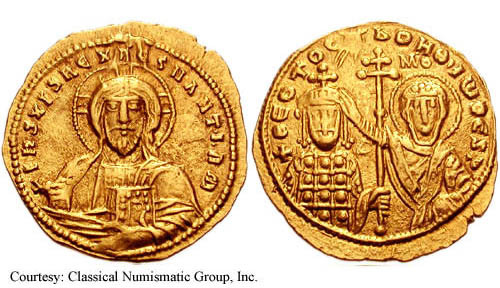 969-976 (Constantinople). $390 4/1/01. SB 1789a AU Histamenon Nomisma Obv: Christ facing bust, raising hand and holding Gospels. Rev: The Virgin Mary on right crowning John I on left, holding patriarchal cross. 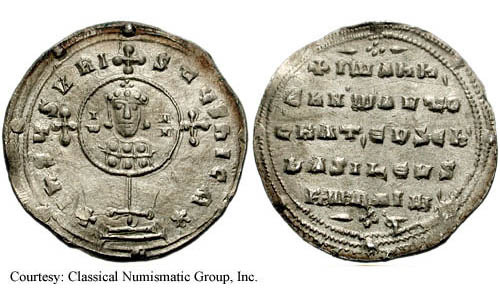 969-976 (Constantinople). SB 1792, DOC III 7a AR Miliaresion Obv: +IhS SXRIST ShICA - Name and bust of John in medallion on cross. Rev: +I Ann'/EnX AV O/CnAT,SV b'/bASIL VS/RO AI ' - Legend in five lines, arabesques top and bottom. (Constantinople). SB 1794, DOC III 8 AE3 Obv: Monogram.